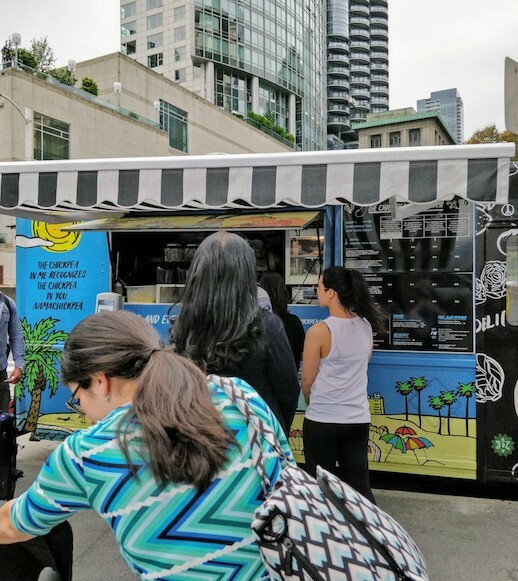 Vancouver – Chickpea Food Truck – vegan in your city. 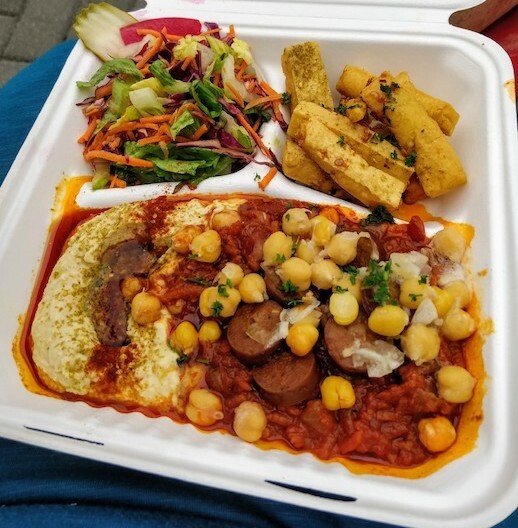 Back when we were in Vancouver we were staying close to Coal Harbour, there were several options within walking distance of our hotel, and plenty of vegan delivery options too. But what a wonderful find the Chickpea Food Truck was. 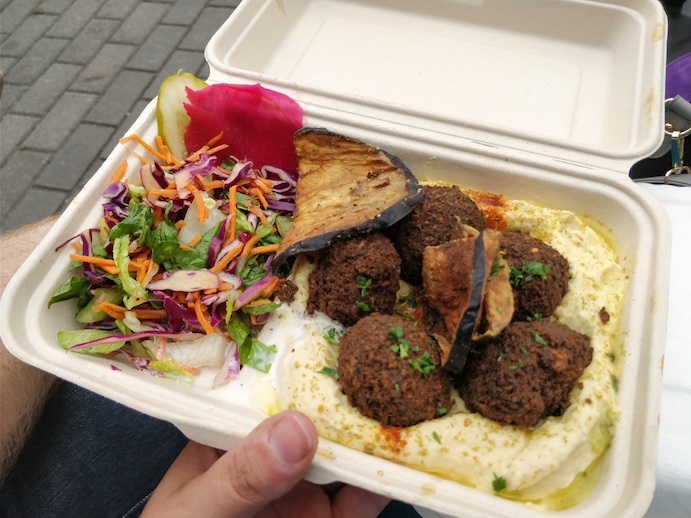 On our first full day there, we met up with some friends for lunch – I suggested the Chickpea truck after finding out their location via the StreetFoodApp (and you can too.) They were at the waterfront near Canada Place (which is their “usual downtown spot.”) We wandered over, and got in line. Plenty of folks were milling about waiting for their order or waiting to order, but the line moved reasonably quickly. I ordered the Shakshuka platter which was a massive amount of food, but was great to share with JC and our son. Once upon a time this platter would have had eggs in it, but Chickpea recently went totally vegan – so the shakshuka was based around chickpeas and nicely spiced tomatoes, with sliced up vegan sausage, a very delicious hummus. The platter comes with a salad and chickpea fries, and you want the chickpea fries, I promise. I’ve had a bit of an obsession with vegan shakshuka for some reason – which started inexplicably because I neither have a nostalgia for it, or a cultural affiliation. I think the first one I tried was one with Tofu with a recipe from A Virtual Vegan, followed a few weeks later by a recipe from One Arab Vegan where silken tofu was the egg replacement of choice. I like them all. And I’m going to keep making shakshuka for breakfast because I can’t help myself. JC got the hummus plate with falafel. The falafel comes with this delicious crispy eggplant, and is drowning in a sea of tasty hummus. The falafel are green inside and amazing (they’re made from a blend of chickpea, parsley, onions, garlic and secret spices) and I would eat them again and again. But I will just have to be satisfied by trying to recreate the recipe at home sometime. Normally I hate parsley, but not here – here it was perfect and made sense. As for the truck, it was busy, but it didn’t take super duper long to get our food. They take cash and cards, and we walked over and sat near the waterfront area and had ample public benches to choose from. The only problem we had was getting drinks – the chickpea truck didn’t have many options – so we grabbed drinks from a convenience store in the area. The cool thing about the Chickpea folks, is that they now also have a brick and mortar restaurant (that had it’s grand opening the day we arrived in Vancouver last month.) So there are more ways to enjoy their food. Looking at the restaurant menu, it’s clear we will have to go back – the hafla will hafta be ordered. We were in Vancouver. Cartems Doughnuts. Get em.